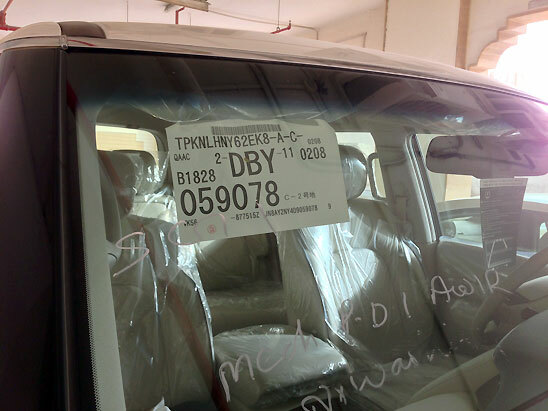 Many of the flashy Land Cruisers, Nissan Patrols and other enormous SUVs favoured by locals frequently have transparent plastic seat covers. Even with air-conditioning on full blast, it can’t be comfortable sitting on plastic. Someone suggested it is to keep the seats clean in order to maintain the second hand value, however I would have thought that most owners were wealthy enough not to have to worry over a little extra depreciation. Either way they drive round with plastic covered seats and also some sort of vehicle ID paper stuck on the windscreen. When I bought our car I ripped this off immediately, although the salesman appeared to think I should leave it in place. I have checked online and can’t find an legal reason to keep this attached to the windscreen as the car was already officially registered. I am guessing it is used as a sign to show it’s a brand new car as vehicle number plates don’t help in this regard, but I can’t think of any other reason to leave it place obscuring the view forward. If anyone knows the reason, please post in the comments. I actually asked why they do this. The locals told me its so people think the car is brand new and they just bought it.